Spoiler alert: No need to make a roux! This green chile mac and cheese is going to become your weeknight BFF. 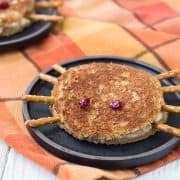 You guys, we need to talk about this recipe. No, actually, go make it first and then we’ll talk. Just kidding, you can read this first but if you ran off to make it right away, I wouldn’t blame you because this is honestly my new favorite mac and cheese recipe. All you need are five ingredients, six if you count black pepper. You don’t need to make a roux, there’s no butter, it’s just so. dang. easy. Here’s what you have to do. Start by boiling pasta – I like to use whole wheat, but if white pasta is your thing, go for it! Once that’s cooked, all that’s left to do is mix it with shredded cheese and Old El Paso green chiles. Dump that into the pan and pour milk over it. That’s right, just go on and pour the milk right on top. 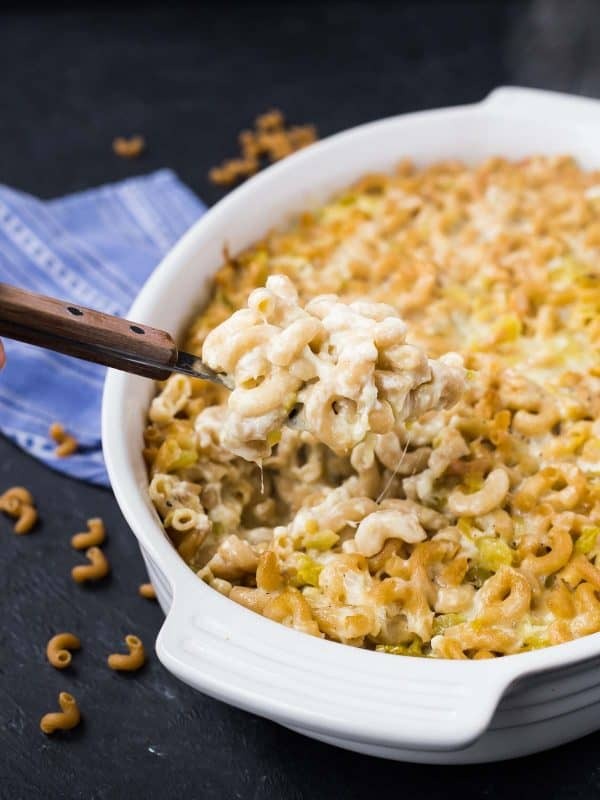 The magic happens while you bake this macaroni and cheese and it turns into a creamy, cheesy, flavorful concoction. The green chiles add the perfect amount of flavor – you wouldn’t believe how fast this disappears! The answer is yes! I would personally cook the pasta and mix it with all the other ingredients except milk, put it in the baking dish and cover and refrigerate up to 24 hours. When you’re ready to bake, get it out of the fridge and let the glass pan come to room temperature. Pour the milk on top, sprinkle with remaining cheese, and bake. 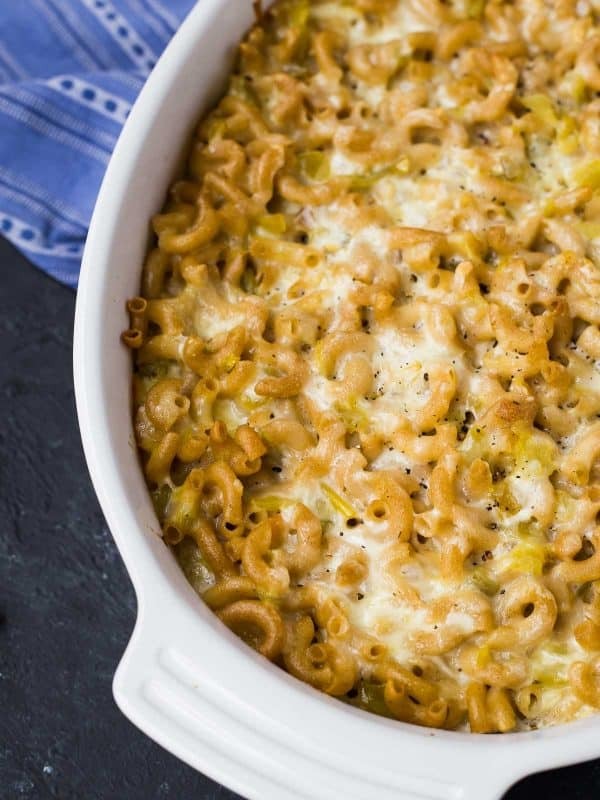 Whether you want to make green chile mac and cheese for Cinco de Mayo or any other night, your entire family will love this twist on the classic baked macaroni and cheese. 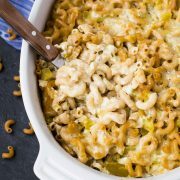 Creamy and flavorful, this green chile macaroni and cheese will change the way you think about macaroni and cheese! There’s no need to make a roux, so it’s one of the easiest things you can make, too! Preheat oven to 375°F. 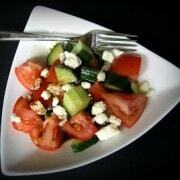 Spray or grease a casserole dish or a 9×13 pan. 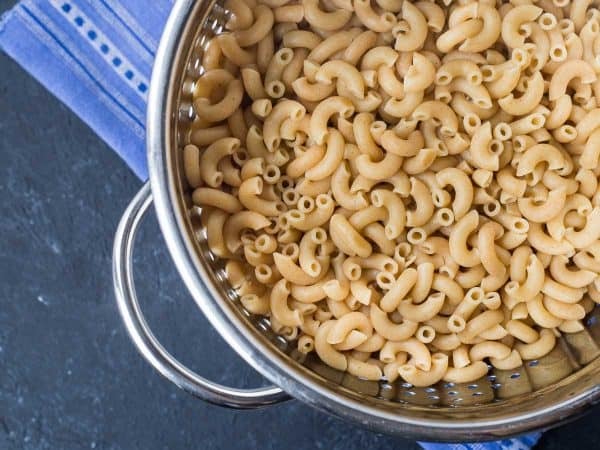 Cook macaroni as directed on the package in salted water until tender, drain. While macaroni is cooking, combine 2 and 1/2 cups of cheese with flour and pepper. 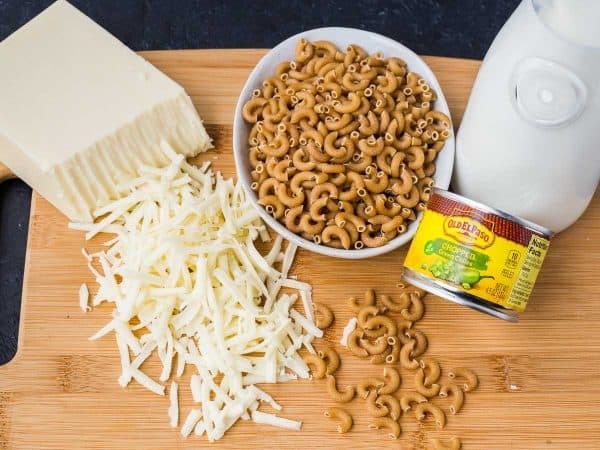 In a large bowl, combine cheese and flour mixture with hot macaroni and green chiles and stir to combine. Pour into the greased pan. Pour milk over macaroni. Top with remaining cheese. Cover with aluminum foil. Bake for 45 minutes (taking the foil off after 30 minutes if desired) or until firm and golden brown. You want to make sure there isn’t a lot of runny milk in it still, poke a knife in the middle if necessary. Some will soak in as it cools but it should be mostly absorbed. (Optional) Let sit for 10 minutes before serving to further firm up. Note: If you like a softer noodle, I’d recommend covering this with foil for the first 30 minutes of baking, or even the entire baking time. If you like super crispy noodles, you can cook uncovered the entire time. Note: Want a little extra spice? Try this recipe with pepper jack cheese. Verdict: I’m completely obsessed with this macaroni and cheese – I’m going to have a hard time not putting green chiles in macaroni and cheese from here on out. Husband’s take: Ben, the traditionalist, prefers regular macaroni and cheese over green chile mac and cheese. But my mom and mother-in-law both raved about this recipe. 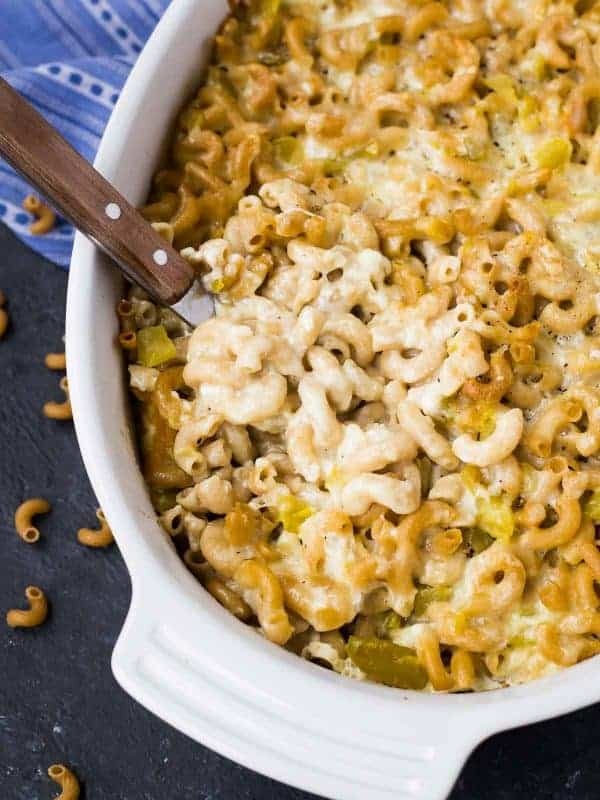 Disclosure: I’m excited to partner with Old El Paso this year to bring you fresh and flavorful recipes like this Green Chile Mac and Cheese Recipe. Thank you for supporting Rachel Cooks by reading about brands we love and use in our own home. Looks like a delicious recipe. Do you have any instructions for making this in a crock pot? I want to make mac and cheese for our Easter gathering. We usually take crock pots. I was thinking that I would make it like you instruct but instead of the oven-place it in the crock pot to cook. I haven’t tried this recipe in a crockpot, so I’m not sure. I’m sorry! If you give it a try, let me know how it turns out! You could absolutely do that! That will be great with brisket! Made this recipe!! It’s in the oven now!! It looked delicious.going in so I can’t imagine what it will taste like out!! I’m very excited for it I loved how much easier it was than cooking my sauce with a roux and it always comes out different. Love the easy aspect. Isn’t it ridiculously easy?! It turns out different than a roux-based mac and cheese, but I love it! I hope you did too! I love the hands-off aspect of this recipe too! I love your additions to make it a hearty meal! Thanks for taking the time to leave a comment! 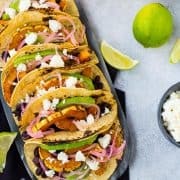 This was so good and easy for a weeknight meal! Made this with fresh hatch chiles, since we have a lot of them, and it was amazing! Thanks for such an easy recipe. Yum! So glad you liked it! Thank you for taking the time to come back and leave your feedback, it means so much to me! An interesting recipe, it will be an exquisite taste. I love the green chiles-green chiles elevate everything! This is great – easy simple ingredients! What a great idea mixing the flour with the cheese and not bothering with a roux. You just changed my life! Woohoo! I’m so glad you like it! I LOVE that you added some green chiles! Some heat and depth of flavor, but not too spicy!!! I love how simple this is. I usually do mac and cheese on the stovetop but this makes it even easier… and for the record, I am always up for adding a little kick! Oh yum!! What’s better than mac and cheese with a little kick?? This sounds delicious!